Simon Wright Racing Developments provides services for the complete spectrum of you karting, from the initial purchase of your kart, to participation within the works Wright Karts team. S.W.R.D. provides a complete race preparation service for your kart and motors. Services range from a simple race check to a full kart strip down, re-jig and rebuild to guarantee your kart is in optimal racing condition. S.W.R.D. also provides a full kart repair service should your kart sustain a heavy impact or breakage. Utilising the in-house workshop (where all of our chassis are produced) we are able to repair/rejig a vast majority of damaged chassis, returning them back to their original state. S.W.R.D. Racing Engines is a subsidiary of Simon Wright Racing Developments and specialises in the servicing, repair and tuning of kart racing engines. S.W.R.D. Racing Engines have been an Iame importer/agent for over 20 years (the longest in the UK). S.W.R.D. also possesses a vast array of knowledge and technical ability in the rebuilding and servicing of retro/historic kart racing engines for the resurgent historic kart classes. S.W.R.D. provide a full dynometer (dyno) facility. We utilise the state of the art “Sport Devices” data acquisition unit coupled with a 100% built for purpose kart dyno. The dyno has been specifically designed to replicate the drag-run of a kart engine on an international standard kart circuit straight, thus giving realistic run times and output figures. The Official Wright Karts Factory Team have benefited greatly from this new facility whch is located on the factory premises. The ability of the dyno to give a measurable quantitative result gives hard evidence on the premium set-up of your materials, whether it be a carburettor, engine or exhaust. The best balance between a number of engines, carburettors and exhausts can also be found to give you the “Ultimate” power unit available to you. The real time recorded traces can be overlapped with any number of previous tests, effectively allowing the optimum engine set-up to be found off track. Allowing you to hit the ground running on your next race/test day. The official race team of S.W.R.D, Team Wright Karts has one of the longest and most successful histories in British Karting amassing British Championship titles spanning from 1978 to the present day. 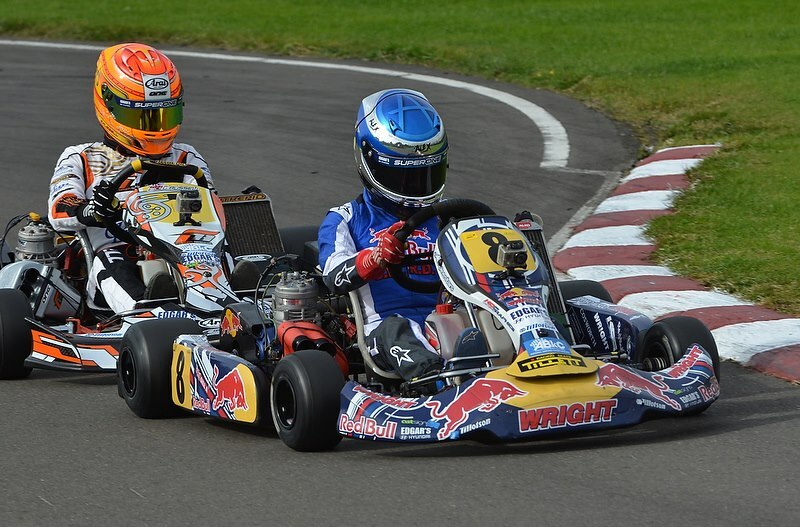 Team Wright Karts caters for drivers of all levels. Drivers from the Bambino class to the KZ and KF series are welcome, with participation in races ranging from winter club meetings to International Championships possible. Recent Team Wright Kart members include: Alex Gill (KF Junior British Champion), Callum Ilott (WSK Master Series Champion), Daniel Ticktum (MSA Cadet British Champion, Richard Bradley (British Open Champion and Le Mans Driver for KCMG), Lee Bell (KF1 British Vice Champion), Jake Rosenzweig (GP2 Championship driver with Addax Motorsport). Team membership enquiries are very welcome.